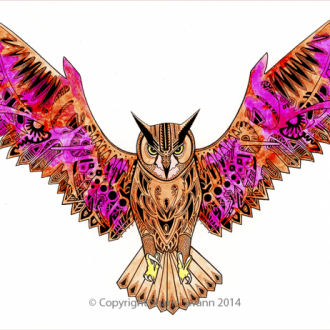 I am aiming to create a collection of wildlife drawings of species that we have lost in the UK due to human activity. 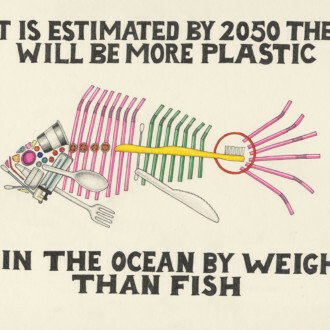 More than 400 species have become extinct in the last 200 years alone and continue to be lost. There are many British species that are also on the brink of extinction, and this is another awareness issue I will soon begin a series of artwork for. In tribute to 18 bees lost from England. There is currently concern at the worlds rapid declining bee population, as they are an essential part in sustaining the world’s vegetation. In England at least 18 species of bee are already extinct, mostly due to human activity, such as agricultural intensification and habitat loss. By creating this piece, I hope to not only promote awareness of the declining bee population, but to also inform people of how many species we have already lost in UK. On the original, underneath each bee I wrote its specie name and the year it became extinct. 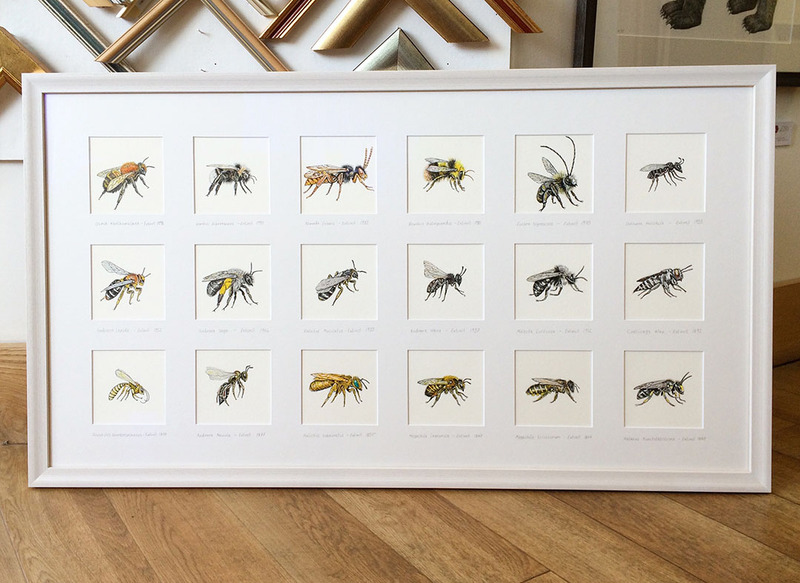 I’ve found that people viewing this piece, at first glance often tend to think its just a pleasing collection of bee images. 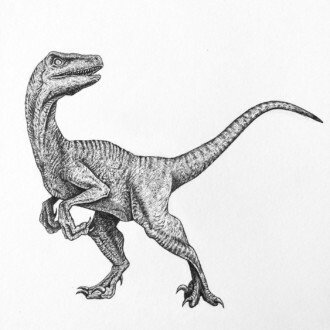 However, once the viewer realises these images are a tribute to the extinct, and we largely contributed to their end, the viewer usually seems rather shocked. I’m hoping that this kind of impact will make a memorable, and influential impression on the viewer. Bumblebee Conservation Trust – Click to find out how you can help Bumblebees. The Species Recovery Trust – Click to read more about lost & critically endangered species of the UK & how you can help. For this piece I drew all eighteen bees individually on small pieces of card, all cut to exactly the same size. This was to insure that on completion, they would all be uniform (this is important for the overall composition). As reference material I used an array of different images and insect archives to to get an understanding and impression of how these bees looked. 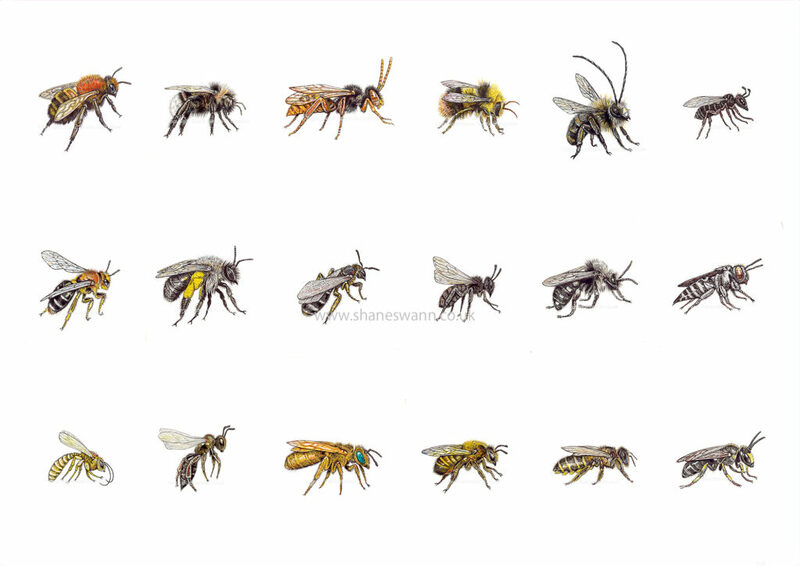 I started creating each bee by drawing a rough online of each one with pencil. Once this was done, I would paint, using watered down acrylic to fill in the basic pigments. Next, the image was ready to work in the detail using extremely fine pens and colouring pencils. 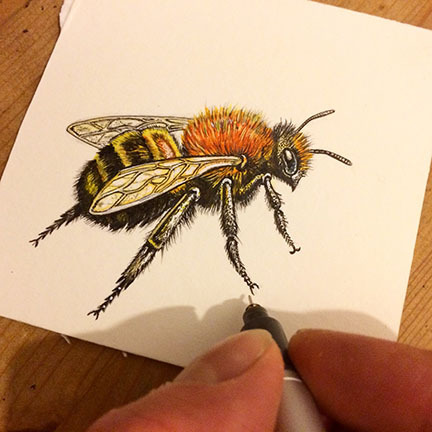 The acrylic showing through the drawn in detail gives each bee a rich, vibrant quality, much stronger than if I have used colouring pencil alone, which was my original plan.